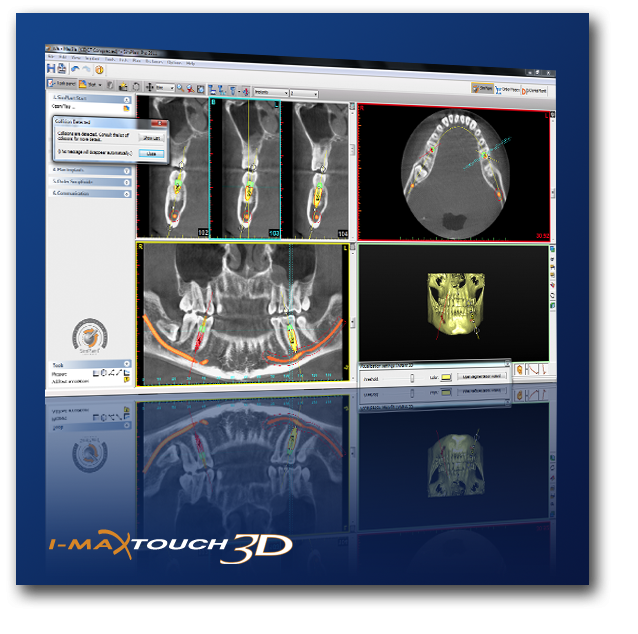 The I-Max Touch 3D, the most recent addition to Owandy's range of digital imaging solutions is evolutive, simple and fast. The panoramic unit acquires 3D exams and complete panoramic exams in the wink of an eye. The cephalometric option further extends the capabilities of the I-Max Touch 3D through the acquisition of radiographies of the skull and the hand. Now, thanks to the unique partnership between Owandy and Materialise Dental, SimPlant ® Pro software comes standard with your panoramic unit in order to offer you ... a turnkey solution: imaging, diagnosis and treatment planning! The operator can place the patient quickly in the ideal position, guided by laser beams (Frankfurt and midsagittal planes). The whole mouth is acquired in a single scan, minimizing the time required for patient immobility. 5 Year Warranty on Panoramic Sensor, Tubehead & 3D Flat Panel. • Diagnosis is possible immediately on the screen. • The added value of the treatment can be clearly presented. • Decision making is shared. A single sensor for panoramic and 3D images offers economy in preparation time. 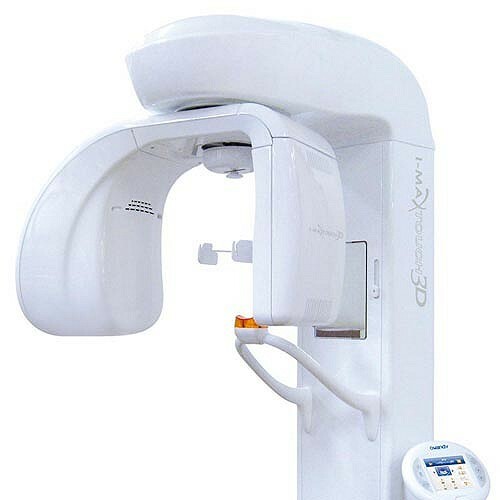 The 3D volume scan (8x8cm) provides an extended examination area, ideal for implant placement. • The I-Max Touch enhances the workflow speed with a panoramic control panel. • The software is designed for tactile and intuitive use of all functions. • You can operate the I-Max Touch with your fingertips. • The LCD touch screen provides an overview of twelve complete programs. • The LCD provides high-definition display of your images. • The I-Max Touch interface is the same as QuickVision imaging software. • Images can be shared on a USB memory stick or network file system. SimPlant is a reliable, user-friendly system that enables you to plan an implant procedure, accurately and effectively with an instant display of compatible implants and abutments and SurgiGuide drill guides. Equipped with a library of more than 8,000 implants spanning 90 different brands, and an accurate mandibular nerve creation tool, SimPlant offers the best 3D diagnostic and implant treatment tools on the market. The software is designed for tactile and intuitive use of all functions. You can operate the I-Max Touch with your fingertips. The LCD touch screen provides an overall view of the many programs and an instantaneous high-definition display of the image. Quality images, clear and informative explanations, an understanding of the treatment plan shared between the practitioner and the patient, that is the full meaning of a relationship based on shared trust. Enjoy the simplicity and functionality of a device that opens up a new world of working comfort and efficiency for you. 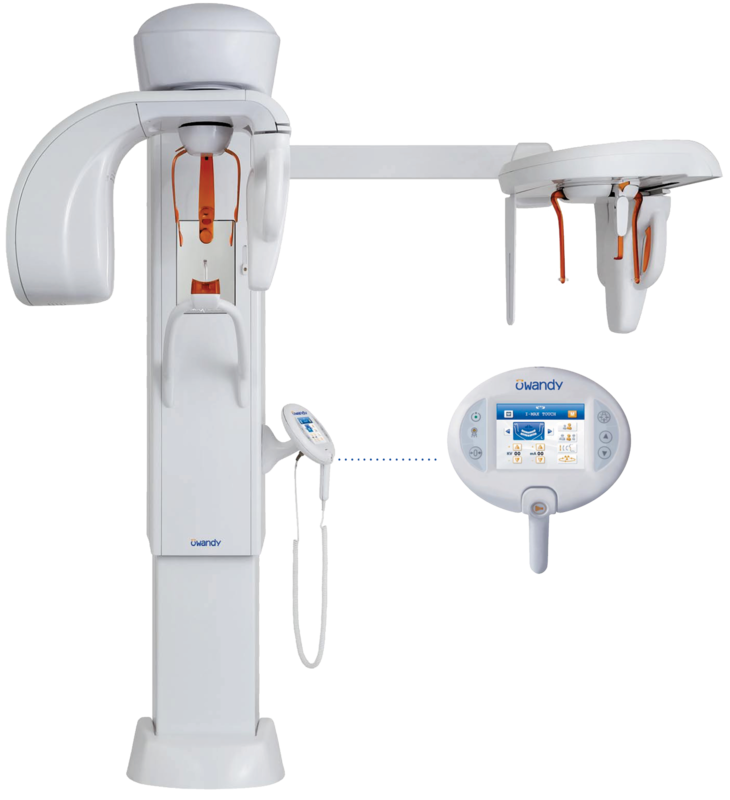 The I-Max Touch is a radiological unit that allows for the radiographic analysis of the maxillo-facial dental structures. It has been conceived to function together with the Julie and QuickVision software ranges.